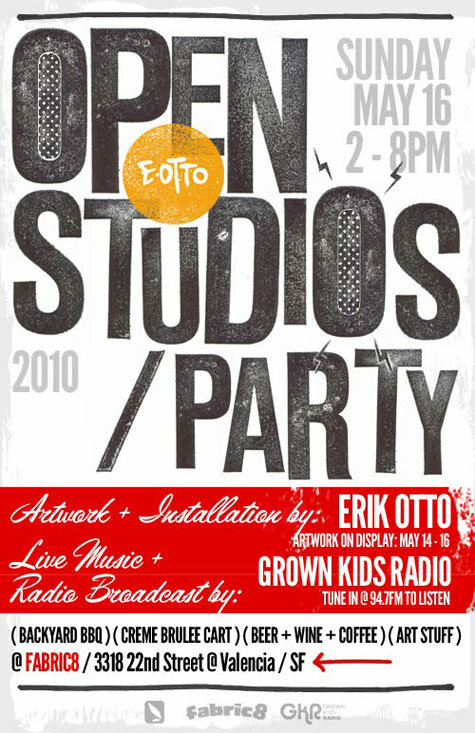 Erik Otto's Open Studio/Party was on display May 14-17, 2010. It featured his recent works, including pieces from his residency at the SF Dump. In addition to Erik Otto's artwork, Sunday saw a daytime party featuring a special radio broadcast from Grown Kids Radio, live painting, a BBQ, free iced coffee courtesy of Stiff Coffee, and the Creme Brulee Cart.